In the summer of 1956 the Byrnes family was living in Rosebud, SD. 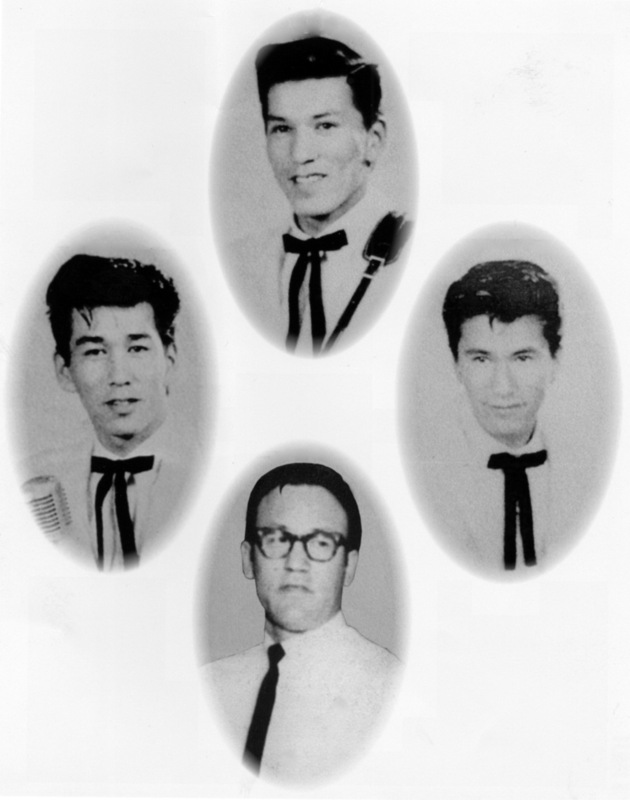 The oldest of the four brothers, Russelll, was a student at the Flandreau Indian School and when he came home for the summer he told his brothers he wanted to start a band. Percy had a red "Chet Atkins" Gretch would play lead, while Dean, who had just finished the eith grade, was directed to the drums. Fred, the youngest brother, was not interested in playing but did join the group later. The boy's mother and her brothers had been in a band when they were younger and she played the piano. It was well known what a beautiful voice she had. Russ lined up jobs for the group at some drive inns as well as the Top Hat in Sioux Falls. They also performed on the Saturday morning show "Stars of Tomorrow" and it was there that they officially took the name The Byrnes Boys. As their popularity grew, They Byrnes Boys played at many dances, especially in central South Dakota. They were on the popular Fresh-Up Freddy Show at radio station KCCR in Pierre as well as Public TV in Reliance. Friend, Ted Bordeoux was an occasional member of the group around 1959 and cousin Calvin Ree played with them for a while in 1960. Brother Fred joined the group around 1963. The family moved to San Jose, California where they performed throughout the Bay Area. They appeared on local TV variety show provided by Jack Webb. The band toured not only the West Coast but also Montana, Idaho, Minnesota and the Dakotas. They later moved to San Diego and won a "best band" contest as well as Percy being named the top guitarist. On one occasion they played at the Little Nashville Club which was owned by Sioux Falls native Johnny White. In the late 1970's the group was traveling to an engagement when they were involved in a bad car accident. Both Percy and Fred were seriously injured and it spelled the end of the band. All of the brothers expect Dean are deceased but he is living in Pierre with his wife and continues to occasionally make music. Dean still has a fabulous voice and listening to him perform an old rock and roll song like taking a step back in time.